So, here comes the most exciting part of the day! HALLOWEEN! No, doubt this is the most awaited part of the year where everyone is super excited to show up in the best Halloween Costumes. Witches, wizards, ghosts, monsters and a lot more. If you are having Halloween related e-commerce business, then this is just the right time to elevate your business and magnify the sales on this Halloween festival! No matter you own a clothing website, restaurant or any other similar business. Be it Halloween costumes, cosmetics, restaurants, accessories, and party planner. You can promote every aspect of your online shops & stores. Simply select the template and customize it as and how you want to. Note: All these email templates are designed using MailGet Bolt’s Drag-n-drop email builder, you can also try this software and can create even more beautiful email templates for your business. Here is the template that will help in the promotion of your clothing and apparel business for free of cost. 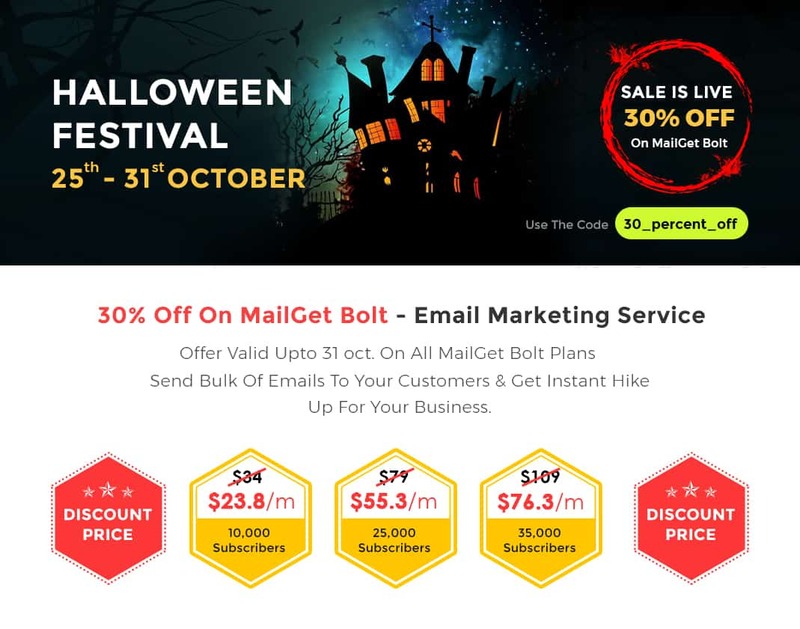 All you gotta do is to customize this email template according to your business needs, send emails to your customers and inform them about the latest Halloween offers & deals. The best way to keep your customers up-to-date about the latest menu and offers with this full responsive email template. This email campaign will help you to grow your business and stand out from the crowd. On Halloween fiesta, you can boost your sales and increase conversion rate through this elegant email template. Along with this, you can also notify the customer about the latest schemes and discounts which you are giving on the cosmetic products. This amazing email newsletter is perfect for any jewelry and accessories business. Its solid design grabs the attention of the customers and helps you to grow your business. Take this email template, if you are going to promote your business online on Halloween. It will help you a lot in your marketing campaign. No need to worry about the design, one can modify this email template and address your customers about the latest deals and discounts that you are offering on the Halloween carnival. I hope you like all these email templates which I have mentioned above. With the help of these newsletters, you can easily promote your business on this Halloween carnival. These top quality email campaign not only boost your sales but also helps you to grow your business. Wanna design your own email templates? Then, try MailGet Bolt – a prodigious email template designer tool. Sign-up for FREE and explore every feature of this service.